Muslin cotton is a type of finely-woven cotton fabric first introduced in Europe from the Middle East in the 17th century. 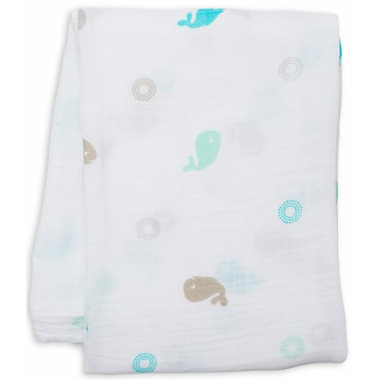 This dual-layer swaddling blanket is made using a loose-weave, breathable muslin cotton, and though it is seemingly delicate, it is extremely durable and holds up to machine washing and drying. In fact, the material becomes softer with each wash. 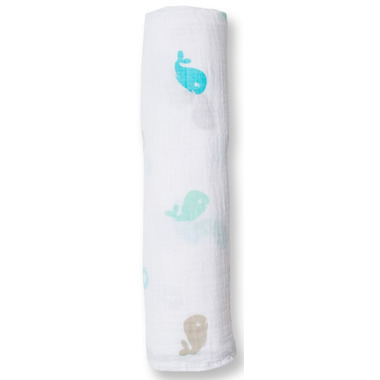 Perfect for swaddling, nursing, as a blanket, or a portable crib sheet. I bought this as part of a shower gift as I could not find it locally. Great size for swaddling and very cute. This blanket is light weight and large in size. I'm sure it will be perfect for warm days as a light cover or cold days with a sleeper. Love this blanket, so soft and versatile. Super soft, cute, great size. Love it. Nice soft muslin blanket and adorable print! It's as nice as the Aden Anais ones we also have. These are very soft and versatile blanket. I loved the whale print as this is the nursery theme.. Washed very well. I love muslin swaddling blankets. I purchased this as a gift and wish I had them for my babies. So soft and gorgeous. Love the whales! Adorable print and super soft. Haven't used with baby yet but am excited to try it out once baby arrives. Love the large size that will accommodate a growing baby. Love this blanket - much cheaper than Adan anais version and is slightly larger for a fraction of the price! Bought 2 and use them all the time! I love the double thickness and it is so soft=perfect as the grandchildren drag these around for years! Bought this blanket from another store before my baby was born. Wasn't sure if it was worth the price. Been using it a lot after I had my little one. The more you wash, the softer it gets! It feels really nice on my skin and my baby loves it. Saw Lulujo blankets on Well and I had to get a couple more. It's better than flannel receiving blankets in warmer weather. Love the pattern. Haven't used it yet baby arrives in 4 weeks, but it feels stretchy and nice and light weight. Looking forward to getting a lot of use out of it.